The Higher League of the 59th Russian championship, which started in Tomsk, does not please the spectator with masterpieces, but a number of upsets makes it exciting for the fan. Can you remember another example from a Swiss when the rating favorites cannot win on 6 top boards, falling to a ‘minus` score, and barely manage 50% on 17 top boards? I failed. It is early for drawing conclusions, but this tournament is clearly very even and unpredictable. I think we`ll see new names among those qualifying for the Superfinal. There is a feeling that at least half of the participants can realistically struggle for the top 7. Even +3 may suffice for it with some luck. However, let us not explore statistics too much, and pass to chess. Fortunately, there are always things to see in tournaments of such level. In order to present the most spectacular episodes of the tournament struggle I will give game fragments, leaving out less interesting parts of the games. The victory of Voronezh grandmaster Konstantin Chernyshov over the Russian former champion was one of the 1st Round upsets. 27...Јc6?? 28.Ґe4. Simply winning material. He managed to return on the very next day, winning a theoretically important Sicilian. This position was considered acceptable for Black. The theory ran 18.a3 with the ending without any advantage for White 18...bxa3 19.Јxa5 ¦xa5 20.¦xa3 0-0 21.b4 ¦aa8 22.Ґg2 ¦ab8! 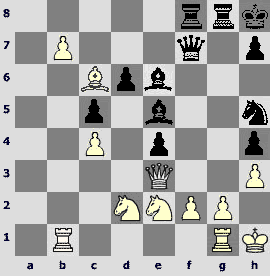 23.¦xa4 ¦fc8 24.ўd2 exf4 25.gxf4 ¤b6© Bacrot-Gelfand, Albert (m/2) 2002. However, it turns out that White has something completely different in his possession. 20...d5?! This is probably a critical position that has to be studied in order to assess Motylev`s innovation. 20...¤c5 21.Јxd6! Јxb4+ 22.c3 ¤d3+! (22...Јxb2? 23.Ґxc5 Јxa1+ 24.ўf2 Јb2+ 25.ўg1ќ; 22...Јe4 23.Јxc5 Јxh1 24.0-0-0 Ґd7 25.Ґb5 Јxd1+ 26.ўxd1±) 23.Јxd3 Јxb2 24.Јb5+ Јxb5 25.Ґxb5+ Ґd7 26.c4; 20...a3!? 21.b3 ¤c5 22.0-0-0 ¤e4 (22...¦c8 23.Ґc4) 23.Јd5 Јxd5 24.¤xd5 ¤xg3 25.Ґb5+ ўf8 26.¦h4. All these lines must be double-checked carefully in order to evaluate the position more accurately. 24.¦h4! Maybe Black missed this important intermediate move. 24...Ґc6. 24...Ґxc2 25.¦c4 Ґf5 26.¦d1 is unacceptable. 25.Ґd2! ¦a7. Hopeless is 25...¦c5 26.¤a6 ¦xc2 27.¤b4 ¦c5 28.¤xc6+ ¦xc6 29.¦xa4ќ. 26.¤b5. White has an extra pawn, and the rest becomes pure technique. 26...¦a8 27.O-O-OҐf3 28.¦e1 Ґf8 29.Ґc4 Ґc5 30.Ґe3 ¦c8 31.Ґxc5 ¦xc5 32.¤d6 ўe7 33.¤f5+ ўf8 34.b4 ¦c7 35.Ґb5 a3 36.¦e3 Ґd5 37.Ґxd7 ¦xd7 38.¦xa3 ¦g8. Now Alexander Motylev delivers an elegant finishing blow. Evgeny Najer missed two ideal goal scoring opportunities. We will start with unexpected finale of a Moscow derby. 33.Јxb4? An unfortunate blunder! Evgeny outplayed the opponent is a positional manner, his passed pawn reached the 7th rank, but now he loses all his huge advantage with a single move. 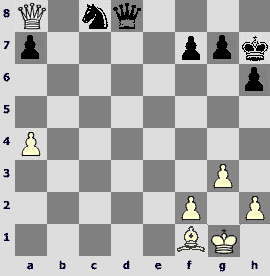 The simplest was 33.¦a5 ¤d7 34.Јb7 Јe6 35.¦d5, and White is about to win. White was close to a victory in the following game, too. 37.Ґd6?! This move makes the victory problematic. Much simpler is 37.Ґc3 to carry out b2-b4 with a tempo. 37...h4 38.ўb5. 38.b4 looked stronger: 38...h3 39.¦h8! ¦xa6 40.b5 ¤a5+ 41.ўb4 ¦a7 42.Ґc5 ¦c7 43.Ґb6 ¦c8 44.¦xh3 with excellent winning chances, however, Black can improve the line by 40...¦a4+! 41.ўb3 ¦f4 42.bxc6+ ўxc6 43.¦xh3 ¦xf2, and the players are about to reach an ending R+B vs. R. Maybe instead of 40.b5, 40.¦xh3 retains the advantage. 38...h3 39.¦h8 ¤a7+ 40.ўb6 ¤c8+ 41.ўb7?It seems White is close to his goal, but Black finds a curious perpetual check idea, and a draw becomes imminent. The game would have continued after 41.ўb5 ¤a7+ 42.ўc4 ¦xa6 43.¦xh3. The next game provides yet another example that the results are not always logical. 18.d5. 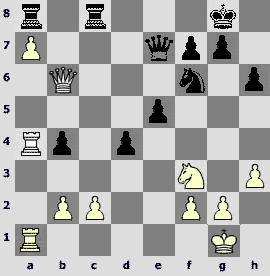 A timely central break, which stresses White`s advantage. 18...exd5 19.exd5 Ґf6. Nothing is changed by 19...¦e8 20.¦fe1 ¤f6 21.Ґe5! followed by d5-d6. 20.¦fe1 ¤b6 21.¤e5!? This is a principled continuation, which requires precise calculation, but in my opinion 21.d6 was simpler, not worrying about 21...Ґxf3 22.gxf3 – White has the bishop pair and a powerful passer in the center. The forced play now begins. 21...¦e8 22.Јh5 Ґxd5 23.Јf5 g6 24.¤xg6 ¦xe1+ 25.¦e1 Ґe6! The only defense! White has to take care of his back rank. 26.Јe4 ¦c4 27.Јe3 ¦c3 28.Јxh6. Refusing the move repetition is objectively correct decision. 29.Јh5?? An unfortunate blunder in a time trouble! After 29.Ґh4! 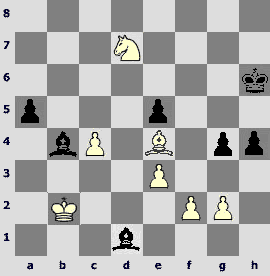 Ґxh6 30.Ґxd8 White retained an extra pawn in the ending. Now Black`s counterattack is unstoppable. The next diagram can be used in textbooks. Black threatens mate on g2, and it seems that White`s hopes must be limited to a perpetual check. The White player found a spectacular draw, but... missed a win! 41.Јf6+? After 41.Ґf6+! ўh6 42.Ґg5+ ўh5 (now 42...ўg7 43.Јf6+! is checkmate) a shocking 43.Ґd2!! forces immediate resignation. A brilliant example of combining attack and defense! 41...ўh6. White wins after 41...¤xf6? 42.exf6+ ўh6 43.Ґg5+ ўh5 44.Ґe3+ќ. 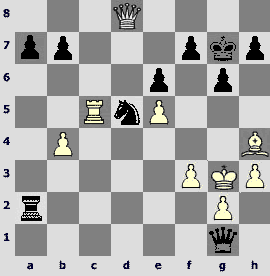 Black did not equalize in a rare line of the Caro Kann. White`s central pawns are ready to advance. However, Dmitry Chuprov abruptly changes character of the struggle, and psychological effect outweighs objective chess evaluation of the position. 16...¦hd8?! This is not a pawn sacrifice but a prelude to a piece sacrifice. 17.Ґxh5 ¤c5! An exclamation mark is given for bravery and consistency. 18.dxc5 ¦d3 19.Јa5 ¦xe3. In principle, Black has no threats, but White must be vigilant. 20.¤b1? Evgeny`s willingness to initiate mass exchanges on the d-file is understandable, but his move helps Black creating real threats. Thec4-pawnshouldnotbeabandoned. I suggest materialistic 20.Јxa7 – the queen will always have some tempo moves to return to White`s camp. 20...Јxc4 21.¤c3 ¦dd3! 22.¦hf1? Of course, it always looks funny with the engine running, but now a real comedy of errors begins. 22.¦xd3 was a must: 22...¦xd3 23.Ґd1! (the only defense against a deadly check from f4 – 23.g3 loses to 23...Јe6!°) 23...Јf4+ 24.ўc2 Јd2+ 25.ўb3 Јxg2 26.¦e1 Ґe6+ 27.ўa3 with a very double-edged game. 22...¦e5? Black missed his win in turn. Probably both players calculated 22...¦xc3+! 23.bxc3 ¦xc3+ 24.ўb2 ¦c2+ 25.ўa1 and overlooked 25...Ґd3! (threatening 25...Јd4+) 26.¦xd3 ¦c1+ 27.ўb2 Јc2+, curtains. 23.¦xd3? Allows Black winning a piece. 23.g3 is better. 23...Јxd3? It is unclear why Black did not take on d3 with the bishop, attacking two pieces and winning material. Maybe he imagined that the text move wins even quicker? 24.¦f2 b6? 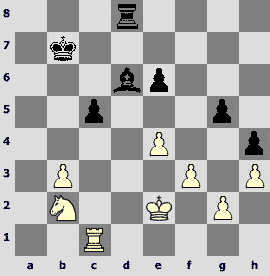 Decisive error – Black voluntarily weakens his king. There was tenacious 24...Јe3+ 25.¦d2 Ґd3, but stronger is 24...¦e1+! 25.Ґd1 (or 25.¤d1 Јb1+) 25...¦f1! 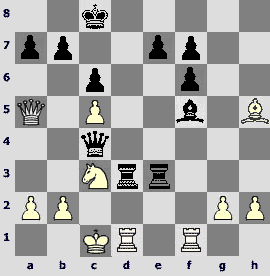 !, and White is forced to 26.¦xf5 (26.¦xf1 Јe3#) 26...¦xf5 27.Јxa7 ¦f2 with unclear consequences. 25.Јa4 Јe3+ 26.¦d2 ¦xc5 27.Јd4. 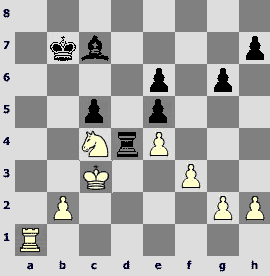 White has consolidated, and finally the outcome becomes clear. Having studied these examples, the reader probably decided that the favorites could be beaten more decisively. This is basically true, but let us not exaggerate. In the next game Moscow grandmaster Sergey Grigoriants demonstrated a thematic piece sacrifice and won confidently. 18.Ґxh6! gxh6 19.Јxh6 ¤f8 20.¤g5 Ґxg5 21.Јxg5+ ўh8. 21...¤g6 does not help: 22.Ґxg6 (if 22.h4 there is 22...Јd8!) 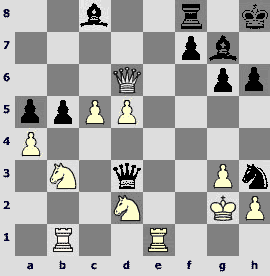 22...fxg6 23.Јxg6+ ўh8 because of 24.¦ce1 ¦e7 25.¦e3 – Black has to drop the e6-pawn to defend against mate. 22.¦ce1 Ґa6 23.Јh6+ ўg8 24.Јg5+ ўh8 25.Јh6+ ўg8 26.¦e3 Ґxd3 27.¦xd3 ¦c4. Now 27...¤g6 is met by 28.h4. 28.¦h3. 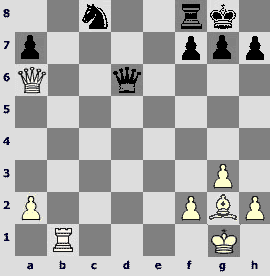 Also wins 28.h4 ¦xd4 29.¦g3+ ¤g6 30.h5 ¦h4 31.¦xg6+! fxg6 32.Јxg6+ ўf8 33.Јf6+. 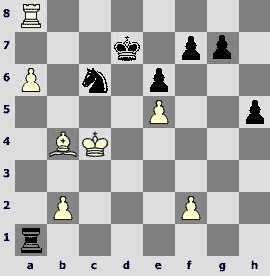 28...¤g6 29.Јh7+ ўf8 30.¦f3 ¦e7 31.Јxg6, and White converted the material (1-0). Denis Khismatullin from Ufa managed to outplay experienced Mikhail Kobalia. Let us see the end of that lengthy struggle. Industrious Black managed to add two edge passed pawn to his bishop pair. Thegameentersadecisivestage. 79...h3 80.gxh3 gxh3 81.c5. White tries creating a counterplay, but I think he should have paid more attention to the e5-pawn. 81...a4 82.c6 a3+ 83.ўa2 Ґg4 84.Ґd5? The last mistake. White is still in the game after 84.¤b6 followed by centralizing the knight. The next game determined a solo leader of the tournament. 40...Јxf2! 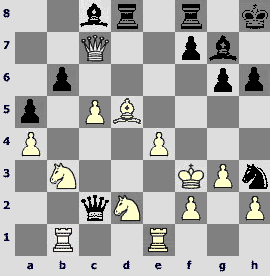 Black allows the pawn to queen, and what he obtains in return? Just... weakness of the g3-square! 41.Јxf2? Surprisingly, this is probably a decisive mistake. The only move is 41.¦b3! The game could continue 41...¤g3+ 42.¤xg3 hxg3 43.Ґxe4 Јxe3 44.¦xe3 Ґd4 or 41...Јxe3 42.¦xe3 Ґd4 43.¦xe4 Ґxg1. 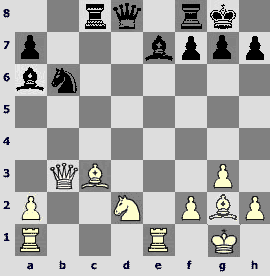 Black is an exchange up in both cases, but the b7-pawn represents certain compensation. 41...¦xf2 42.b8Ј ¦xe2! I don`t want to bother studying a weak-hearted 42...¦xb8 43.¦xb8+ ўg7. 43.Ј:g8+. There is no way White can keep the queen: 43.Јc7 Ґxh3! 44.Ґd5 (the reader will easily find that there are no better moves) 44...¤g3+ 45.ўh2 ¤f1+ 46.ўxh3 (46.ўh1 ¦exg2°) 46...¦g3+ 47.ўh4 Ґf6+ 48.ўh5 ¦g5+ 49.ўh4 ¦g6+ 50.ўh5 (50.ўh3 ¦g3#) 50...¤g3#. A bit more tenacious is 43.¤xe4, after which Black wins by 43...¦xb8 44.¦xb8+ ўg7, and White has no adequate defense against a blow on e4, after which Black obtains three minor pieces for two rooks, and a completely winning position. 43...ўxg8 44.¤xe4 Ґf5. 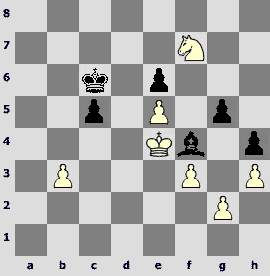 White cannot hold the knight in the center, so his game is lost. 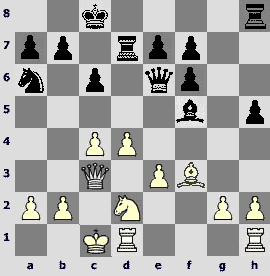 Pure positional wins are rare nowadays, so enjoy Alexander Khalifman`s effort against his young fellow Petersburger. 1.d4 ¤f6 2.c4 e6 3.¤f3 b6 4.g3 Ґa6 5.b3 Ґb4+ 6.Ґd2 Ґe7 7.Ґg2 c6 8.Ґc3 d5 9.¤e5 ¤fd7 10.¤xd7 ¤xd7 11.¤d2 O-O 12.O-O ¦c8 13.e4 c5 14.exd5 exd5 15.dxc5 dxc4 16.cxb6!? A fresh move. Radjabov managed to trouble Leko in the latest Linares with it. 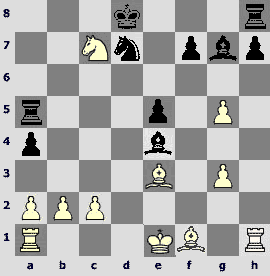 16.c6 is analyzed to the draw. 16...¤xb6 17.¦e1 cxb3. Radjabov-Leko continued 17...Ґf6 18.Ґxf6 ¤xf6 19.¤e4 Јg6 20.Јd6 Јxd6 21.¤xd6 ¦cd8 22.¤f5 g6 23.¤e3 ¦fe8 24.Ґf1І – White won a pawn, but Black held in a 4-rook ending. 18...¦xc3! ?N Earlier Black preferred 18...¤d7. White has an advantage in this open position, his bishops being especially effective on the main diagonals, therefore Black logically seeks simplifications, but he fails to equalize completely. 19.Јxc3 Ґf6 20.Јa5 Ґxa1 21.¦xa1 ¤c8?! 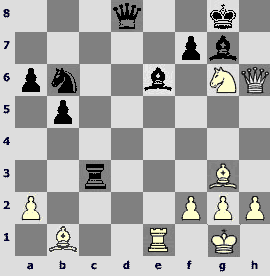 Black keeps a knight against a bishop, which is unpleasant in positions of this kind. 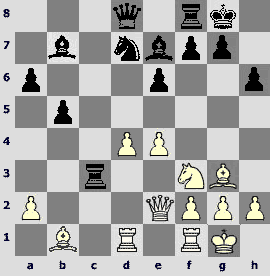 Maybe he should have preferred 21...Јc8, although White keeps an edge after 22.¦e1 ¦d8 23.¤b3І. 24.Ґf1! In principle, exchange of queens in such situations favors White, while the rooks should be kept on board, but one should not be too dogmatic about such stuff, as the subsequent moves confirm. 24...Јc5. If 24...Јxa6, then 25.Ґxa6 ¤b6 26.¦e1±. 25.¦d1 Јc7 26.a4 h6 27.Јc4 Јe7. A "wrong" 27...Јxc4!? 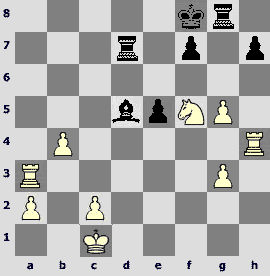 28.Ґxc4 ¤b6 is interesting, but White can continue playing for a win by 29.Ґb3! (29.Ґb5 a6 30.Ґc6 ¦c8 31.Ґb7 ¦c5! is only a draw) 29...a5 30.¦e1 ¤d7 31.¦e7 ¤c5 32.Ґc2 ¦a8 33.¦c7 ¤e6 34.¦b7. 28.Јc6! Threatening to bring the rook to the 7th rank. 28...¦d8 29.¦xd8+ Јxd8 30.Јa8. Black managed to trade rooks, but the back rank pin is highly annoying. 31.Јb7! White finds a long-awaited second weakness. 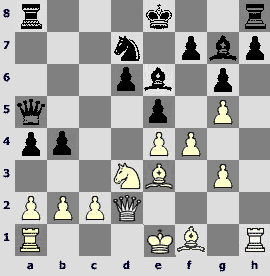 There is no need to rush taking a pawn by 31.Ґh3 Јd1+ 32.ўg2 ¤b6 33.Јxa7 Јd5+ (33...¤xa4? 34.Ґf5+ќ) 34.ўg1 Јd1+ 35.Ґf1 ¤xa4 36.Јxf7. 34...Јe7. 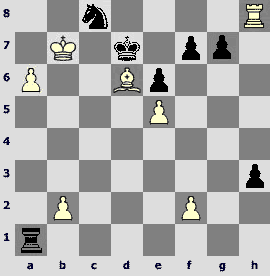 This is not exactly an error – Black was helpless against White`s gradually improving his position. Now Khalifman confidently converts an extra pawn. 35.Јxc8 Јxe2 36.Јxf5+ ўh8 37.Јc8+ ўh7 38.Јc6 Јd1+ 39.ўg2 Јd4 40.Јe6 Јc5 41.g4! A classic plan! 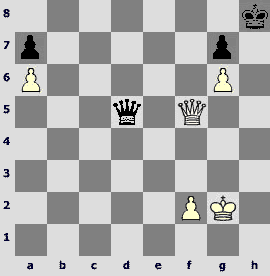 The pawn reaches g6, adding mating threats to the scene. 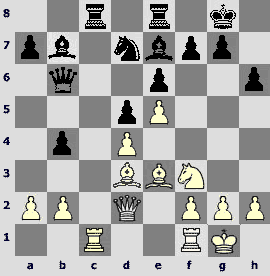 41...Јd4 42.h4 Јd8 43.Јf5+ ўh8 44.g5 hxg5 45.hxg5 Јd6 46.g6 Јd5+!? This elegant stalemate trick only amused the watchers a little. Alexandra Kosteniuk is the only woman in the Higher League. She does not betray her attractive creative style. A sharp 1st round game with Artyom Timofeev ended in a draw, then another game with a representative of our "golden young generation" followed, and again the watchers were not disappointed. 1.e4 e5 2.¤f3 ¤c6 3.Ґb5 a6 4.Ґa4 ¤f6 5.O-OҐe7 6.¦e1 b5 7.Ґb3 d6 8.c3 O-O 9.h3 Ґb7 10.d4 ¦e8 11.¤bd2 Ґf8 12.d5. One of the main lines, the other being 12.a4. 12...¤b8 13.¤f1 ¤bd7 14.¤g3 ¤c5 15.Ґc2 c6 16.b4 ¤cd7 17.dxc6 Ґxc6 18.Ґb3 h6. 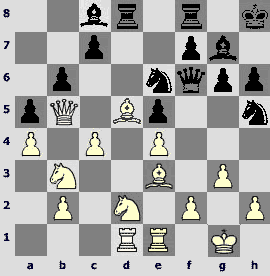 The players reached a well-known position of Zaitsev Variation of the Ruy Lopez. 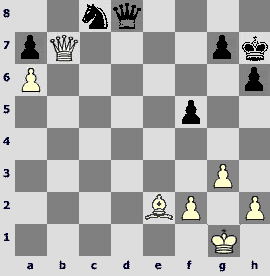 White usually tried 19.¤h2, but without much success. Alexandra selects a rare continuation. 19.Јd3 Јc7 20.¤h4 Јb7N. A new move. Black`s main idea is to carry out d6-d5. In Dolmatov-Ibragimov (Azov 1995) he achieved in a different way, and also equalized after 20...¤b6 21.¤g6 d5 22.exd5 Ґxd5 23.¤xf8 ўxf8=. 22.¤h5!? White uses tactics to disclose disadvantages of Black`s setup, but Ernesto is alert. 22...dxe4! 22...¤xh5 23.exd5 or 22...¤xe4 23.¤hxg7! Ґxg7 24.¦xe4! followed by the queen moving to g3 was okay for White, but now what? 23.Јg3! ¤xh5 24.Јg6! White attacks not only spectacularly but also very accurately. 26.Јh4? Alas, Alexandra rejects 26.Ґxh6! After 26...gxh6 Black is better in case of 27.¤xh6 ¤f6, but the stronger is 27.¤d6! The game may continue 27...Ґxd6 28.Јxh6+ ўg8 29.¦e3! (weaker is 29.¦ad1 Ґxb3 30.Јg5+ ўf8 31.Јh6+ ўe7 – the king runs away from the destroyed wing) 29...¤f8 30.¦g3+ ¤g6 31.¦xg6+ fxg6 32.Јxg6+ ўh8 33.Јh6+ ўg8 with perpetual, or 27...Јc6 28.Ґxd5 Јxd6 29.Јxf7 ¤f6 30.Ґxa8 ¦xa8 31.a4 with a complex game, in which White has his chances. 26...¦e6. This solid move kills all sorts of tactics. 27.Ґxd5 Јxd5 28.Јxe4 Јxe4 29.¦xe4 leads to a worse endgame for White, but an attempt to complicate things with queens on board also failed. Ernesto Inarkiev showed surgical precision in the concluding part of the game. 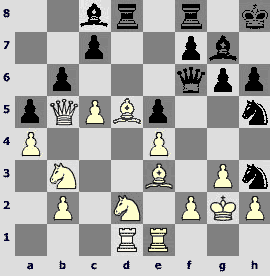 White has a big positional advantage, the knight is much stronger than the bishop, and Black`s pawn are weak. A smart knight maneuver nets a central pawn. 33.¤d2!? Ґb6 34.¤b3 ¦b4? Clearly underestimating White`s next move. The rook had to retreat on the d-file. 46.¦d1. Forcing exchange of rooks. 46...ўc7 47.¤c4 Ґg3 48.¦xd8 ўxd8 49.ўd3 ўc7 50.e5 ўc6 51.ўe4. The king is centralized, and the knight raid to the rear decides. 51...ўb5 52.¤d6 ўc6. Also hopeless is 52...ўb4 53.¤f7 ўxb3 54.¤xg5 c4 (54...Ґf4 55.¤d8) 55.¤xe6. 54.¤h8! ўb5. If 54...ўd7, then 55.¤g6 Ґg3 56.f4ќ. Dmitry Andrejkin`s game is completely different – everything was decided in a sharp middlegame. 1.e4 c5 2.¤c3 ¤c6 3.¤ge2 d6 4.d4 cxd4 5.¤xd4 ¤f6 6.h3. Robert Fischer used to handle such schemes perfectly, and now Sergey Movsesian is the main expert in them. 6...a6 7.g4 e6 8.g5!? The move 6.h3 is more often linked with developing the bishop to g2, however, the Keres Attack stocks are rated so highly now that White readily goes there even without a tempo. 8...¤d7 9.h4N. A novelty. Earlier move is 9.Ґe3. It is funny that the position after 9.h4 occurred several times in practice, but with White to move. Logic suggests that an extra tempo has to mean something, but it is difficult to pick on Black`s particular mistakes – her position worsened gradually. 9...¤de5. I think 9...Јb6 forcing the knight away from the center was more accurate. 10.Ґe3 b5?! Maybe 10...¤xd4 11.Ґxd4 Јa5 or even 11...h6!? with a complex game was better. 11.¤xc6 ¤xc6 12.Јd2 Ґb7 13.f4 Јc7 14.Јf2. White develops his initiative. Alexandra Kosteniuk tries to increase the pressure on the center, but her counterplay is late. 14...¤b8 15.a3 ¤d7 16.f5 ¤e5? Black has a difficult position. The lesser of evils is 16...exf5, not allowing to create a weakness on e6. 17.fxe6 fxe6 18.Ґh3 Јf7 19.Јg3 ¦c8. 19...¤f3+ 20.ўe2 ¤e5 21.¦af1 is unlikely to change anything. 20.¦f1 Јe7 21.Ґd4 ¤c6 22.Ґg1 b4 23.axb4 ¤xb4 24.O-O-O ¦c4. Black is helpless. Andrejkin efficiently prevents any complications. Ian Nepomnyaschij has already defeated experienced Sergey Volkov, but I`d like to draw your attention to another episode. The young player ended up in a difficult position, but demonstrated his best traits – bright imagination and tactical skill. White seized the initiative in the opening, then sacrificed an exchange, obtaining excellent compensation. His next move makes Black`s situation desperate. 34.¤c7! 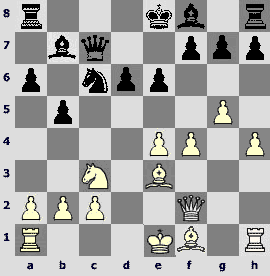 Now 34...¦d8 loses to 34.¤e6, and 34...¦c8 – to 34.¤b5. More tenacious is 34...¦b8, but after 35.¤e6 Ґc3 36.¤g5 Black will not last for long. Ian finds the best practical chance. 35...¤xf2! Ian is not interested in 35...¤e5 36.Јd5. 36.¦xf2? 36.¤xe8 was necessary – after a few checks with the knight White takes on f2 with the rook, and the rest is easy, but Bocharov misses a sharp-witted tactical idea of the opponent. 36...¦xf4! 37.Јxf4 Ґxf2+ 38.Јxf2 Јc1+ 39.Ґf1 Јxc7. All active pieces of White are removed from the board, and the worst for Black is behind. The youngest St. Petersburg player succeeded in the following spectacular although not perfect game. 23...¤g5. Black aims at the king, although 23...Ґd7!? 24.Ґc6 Ґxc6 25.Јxc6 ¤hf4 is a viable alternative. 24.c5. 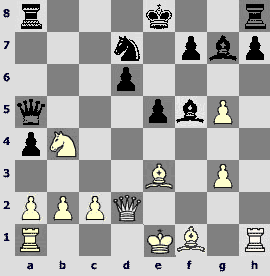 In retrospect one can advise 24.Јc6, but White did not plan turning to a defense. 25...¤5f4+! Brave, consistent, and strong! 26.Ґxf4! In case of 26.gxf4 exf4 27.Ґd4 Јg5+ 28.ўf1 (the only move) Black forces White`s king staying in danger zone by unobvious 28...¤g1! (immediate 28...c6! is not bad, but we don`t want to allow 29.¤f3!? ), and after 29.¦e2 (what else?) adds up the heat by 29...c6! with exemplary line running 30.Јxc6 ¤xe2 31.ўxe2 Ґa6+ 32.¤c4 (or 32.Ґc4 Ґxc4+ 33.¤xc4 f3+ 34.ўd3 bxc5°) 32...¦xd5!°. 26...exf4 27.Јc6?! Better is 27.e5 Јf5 28.¤f3 with mutual chances. 27...Јxb2?! Taking too much risk. Black could transfer to a technical stage by 27...Јxc6 28.Ґxc6 Ґxb2, although one had to foresee 29.¤c4 (or 29.cxb6 cxb6 first, doesn`t matter) runs into 29...f3+! 30.ўxf3 ¦xd1 31.¦xd1 Ґg4+!, winning material. 28.¦b1 Јc2. Immediate 28...f3+!? is interesting: 29.ўxf3 Ґd7! 30.Јxc7 Јf6+ 31.ўg2 Јxf2+ 32.ўh1 Ґxa4 33.¦f1 Јe2. 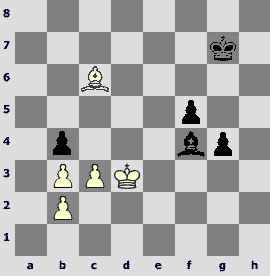 Black returns to this idea on the next move. 29.Јxc7? A careless move, better is 29.¦bc1. 29...f3+! 30.ўxf3. The king has to advance. 30...¦xd5? Tempting but unsuccessful decision. Black had two options that decided the game – 30...f5! and 30...b5! – I cannot see any defense. 31.exd5 Јf5+ 32.ўg2 Јxf2+ 33.ўh1. Raising doubts whether Black has any compensation for a sacrificed exchange. 33...Јf5 34.Јd6 Јd3 35.ўg2 b5!? 36.¦bd1? White makes the last mistake in this game! It was necessary to coordinate the forces, but it is not easy to find the solution. For example, 36.¤f3 is strongly met by 36...Јc2+ 37.¤bd2 Ґg4. 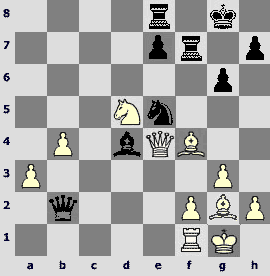 Correct is 36.¦a1!, protecting the a4-pawn and obtaining an additional defensive resource Ra2. 36...Ґg4 37.¤c1. 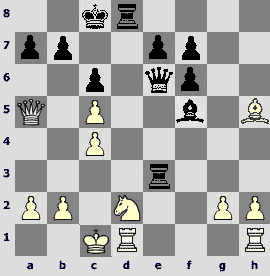 An interesting position arises after 37.axb5 Ґxd1 38.¦xd1 Јe2+ 39.ўxh3 Јxd1. Black wins thanks to weakness of the enemy king and the threat of 40...a4, e.g. 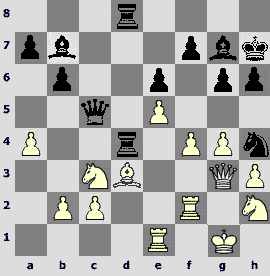 : 40.b6 a4 41.b7 axb3 42.b8Ј ¦xb8 43.Јxb8+ ўh7 42.c6 (42.¤xb3 Јf1+ is checkmate) 42...Јxd2 43.c7 Јd3! 44.c8ЈЈf1+ 45.ўg4 h5+, and a checkmate. Now 37.¦a1 is late due to 37...¤g5! with numerous threats. 37...Јc2! 38.axb5 Ґxd1 39.ўxh3 Јxd2. 39...Ґg4+! is a bit more neat, but it makes no difference already. Rating favorite Vladimir Malakhov registered his first win in the third round, although the opponent clearly overestimated his attack. 30.Ґf8 ¦g5. Incaseof 30...Ґg5? 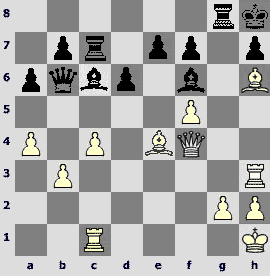 White has a pleasant choice between human 31.f6ќand computer 31.¦cc3ќ. 31.Ґh6 ¦g8. 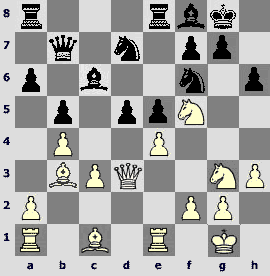 A draw by repetition would have been a just conclusion – attack and defense balance each other, but White overambitiously decides to continue playing. 32.Ґf8 ¦g5 33.Јh4?! h5! This move is a headache for White, whose queen is very badly placed on h4. 34.Ґh6 ¦xf5! Maybe White only expected 34...¦xg2 35.Јxh5 ¦xh2+ 36.¦xh2 Ґxe4+ 37.¦g2 Ґxg2+ 38.ўxg2 Јxb3 39.Јxf7 Јb2+ 40.ўf3 with decisive threats? 35.Јe1 ¦e5 36.c5? The last chance is missed here: 36.Ґf4! ¦xe4 37.¦xh5+ ўg8 38.Јg3+ ўf8 39.c5! Јa7 40.cxd6 exd6 41.Ґxd6+ ¦ce7 42.Ґc5 with an unclear game. I shall end the review of the starting round with tragicomic example of endgame theory ignorance. 36.cxb4?! Taking a completely useless pawn. There is an elementary book draw: 36.ўe2 Ґd6 37.ўf2 ўf6 (or 37...f4 38.Ґd7=) 38.Ґb5 f4 39.Ґe2=. 36...ўf6 37.b5 Ґc7 38.Ґd7? 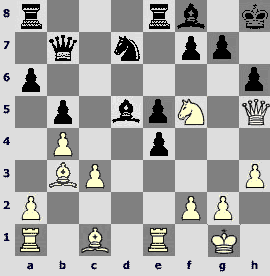 Cooperation continues – White allows the pawn to f3. After 38.ўe2 f4 39.ўf2 or 38... Ґb6 39. ўf1 the king stands to g2 with a simple draw. 38...Ґb6 39.Ґc8 ўg5 40.Ґd7 f4 41.ўe2? Equals resignation. It seems a study-like 41.ўe4 f3 42.Ґe6 ўh4 43.Ґc4! ўg3 (or 43...ўh3 44. Ґf1+! ўg3 45. ўf5!) 44.ўf5! saves even here!